A great diversity in restaurants establishes Toruń as a truly culinary city. Visitors who are short of time and travelling on a budget may choose to eat in a canteen or fast-food bars where they can have a two-course meal for only 15 - 20 zl. Evenings and weekends tend to be particularly busy and despite that there are some 140 restaurants within the Old Quarter it often happens that there are more customers than tables. 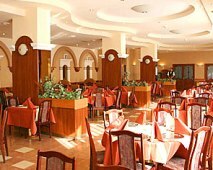 Prices of food in Toruń's restaurant are below the national average for restaurants in cities. But they are also differentiated - the highest are in exclusive and refined places. Here certainly 100 zl per person will suffice for a three-course meal. Credit cards should be accepted by all the larger restaurants. 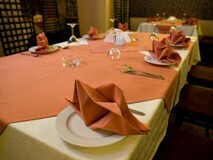 Some restaurants offer dishes of 'local cuisine'. In their menus you can find sour rye soup, roast, etc. cooked in a special manner that is characteristic for Toruń. However, it is not quite true that their taste is that unique; recipes are a bit different but they definitely aren't related to the cuisine of old Toruń. Local patriciate ate crayfish dumplings, dried cod and ide with raisins and nuts in almond marinade, violet and beer soup. But nowadays you can't find those dishes anywhere and probably nobody knows their taste. The only thing that has been followed is drinking a huge amount of beer – basic consumer article since the Middle Ages. Anyway, each and every method to get a customer is good. Nevertheless, we recommend for instance coffee with gingery sprinkling – gingerbread has always been speciality of Toruń. The most famous product of Toruń that has been made for centuries and one of the most popular Polish food products is Toruń gingerbread. You may buy gingerbread in the whole Poland, but nowhere else will you get such a variety of shapes and sizes and most important, taste. The phenomenon of the Toruń’s gingerbread is not only the taste but also the decorative, beautiful forms. The moulds richly decorated are the piece of art themselves and represent a high level of the old Toruń wood-carving. This is one of the musts if you are in the area, or if not, try to find a brand shop of "Toruńskie Pierniki". See more here. Don’t expect a gastronomic experience. Once subsidised by the state, this was food for the masses back in the day. With the fall of communism many of 'bar mleczny' found themselves forced out of business although a few of these canteens have survived and, side from offering an interesting diversion for amateur anthropologists, they make it possible to eat lots in return for a handful of coins. A Polish friend will know which are the best and it is still interesting to see many younger Poles still making regular visits to their favourite one. Value is value wherever you are. Queue up at the counter, peruse the choice of soups, meat and veg on offer before placing your order, then watch in awe as matronly ladies serve up everything from budget excellence to bowls of slime. We’ve seen both ends of the scale being reached in the same place. One tip is to go earlier as the choice and quality in some tends to fall as the day progresses. In Toruń keep an eye out for Bar Mleczny "Pod Arkadami" on Różana Street or "Małgośka" on Szczytna Street. Many night clubs in Toruń Old Quarter are run in old Gothic bricked and vaulted cellars that remember medieval tavern or stores. They make a unique atmosphere of the city. Most of them you can find on Rynek Staromiejski (Old City Market Sq. ), Szeroka Street, Chełmińska Street or other. Krakow has its "Wierzynek" and Toruń "Pod Modrym Fartuchem" ("Blue Apron Inn"), a little more modest in several respects but since 1489 one can spend time there and you must know that this is the oldest local in Toruń, and probably one of the oldest in Poland. Fortunately, despite the expiry of years had not changed. Atmosphere old and location ideal for tourists walking the street round Rynek Nowomiejski (New City Market Sq.). Stylish and exclusive restaurants that may satisfy your higher requirements are: "Pod Arsenałem", "Karczma Spichrz", "Zaczarowana Dorożka" or "Petite Fleur". You don’ t expect it of Poland, but it really does get bloody hot out in summertime. It’s at this time you’ll find the streets transformed into a jungle of parasols as bar owners compete for the custom of the warm weather, part-time drinker. One Polish speciality is a profusion of excellent smoked meats, especially sausage (kiełbasa), very popular throughout the world, made after traditional recipes and smoked over juniper or fruit-tree twigs. You'll be delighted by the cured and smoked hams, poultry, pork and beef fillets, and bacons. Poland is renowned for its multifarious types of delicious bread. An essential part of the main Polish meal of the day - which, incidentally, is eaten much earlier than in the West - is soup. Soups usually starts off the meal. 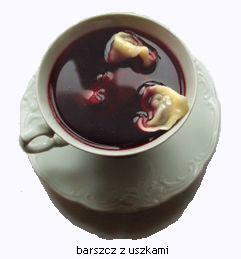 One of the most popular soups in the country is barszcz (fermented beetroot soup), often served with beans or uszka - ravioli-type pastries stuffed with meat or mushrooms. Another tasty fermented soup is żur - made of rye-flour and cooked with mushrooms, and served with potatoes, diced sausages and hard-boiled eggs. A true gourmet treat is wild mushroom soup thickened with sour cream and served with tiny uszka. 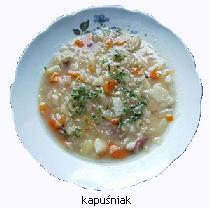 Other popular soups are kapuśniak (made of brined cabbage), pomidorowa (tomato soup). And there is also rosół - poultry or beef bouillon served with noodles and sprinkled liberally with parsley. Perhaps the best-known Polish culinary classic is kotlet schabowy - fried pork loin chop coated in breadcrumbs and served with potatoes and cabbage. One of the best beef dishes is zrazy zawijane - stewed rolls stuffed with a pickled cucumber, a piece of sausage and mushrooms, and served with buckwheat groats. The Polish cuisine is noted for superb dumplings, especially pierogi, which are made from noodle dough, stuffed with minced meat, chopped brined cabbage mixed with mushrooms, cottage cheese, or fruit, and boiled. One favourite variety is pierogi ruskie, with a stuffing of cheese, potatoes and fried onion. (pancakes), pyzy (steamed dumplings made from potato flour) and knedle (dumplings stuffed with fruit). the kitchen sink, the stew is left to gestate, sometimes underground, for a few days for full flavour infusion. 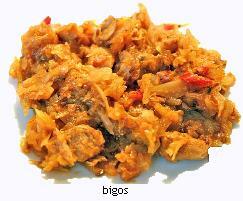 A Polish restaurant or prospective wife can be fairly measured on the strength of their bigos. Teutonic Order, and their unlikely subsequent victory has been attributed to the hearty meal ever since. The Polish equivalent of French crepes are naleśniki. These are thinpancakes wrapped around pretty much any filling you can dream of, savoury or sweet. As for drinks, the Polish speciality is clear vodka, but there are also many popular flavoured brands. These include Zubrowka ("bison vodka") with a grass blade from the Bialowieza Forest. Beer lovers won't be disappointed either: Polish beer is as good as German or Czech, and many breweries, notably in Żywiec, Warka, have been well-known for centuries. Soup usually starts off the meal. Appetisers include smoked salmon (łosoś wędzony) or smoked eel (węgorz wędzony) as well as variety of aspic dishes, herring (śledź) in various forms, salmon and the authentic Polish cold cuts and sausages. Hot appetisers are also popular and these include pan fried mushrooms, tripe and snails which originate from Poland. The authentic Polish salad is the surówka which contains of grated winter vegetables like cabbage, red cabbage, carrots, leeks and apples. A tasty but simple salad is mizeria, sliced raw cucumbers in sour cream or sour milk. Tomatoes in Poland are among the best in the world so any salad should taste exceptional. The main meal in Poland nearly always consists of some type of meat. Pork is the national meat of Poland and many main dishes will contain it. 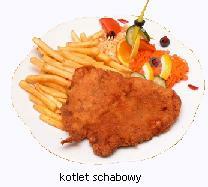 Pork appear as boneless pork chop (kotlet schabowy) or pork loin (pieczeń) which is usually served with some type of sasuce. This sauce should be sos myśliwski, usually a sweetish sauce with raisins and honey among the ingredients or sos grzybowy - a wild mushroom sauce. Traditional Polish poultry dishes include chicken Polish style and duck filled with apples. Polish fish dishes are highly recommended. They feature a variety of types of fish: eel, pike, perch, sturgeon, sea fish. They can be cooked in many different ways: boiled, fried, roasted and served with delicious stuffing, sauces and accompaniments. Carp is especially popular and is the traditional Christmas Eve dish. Poles are habitual tea and coffee drinkers generally with heaps and sugar. Coffee (Polish: kawa) in Poland is served black unless you ask otherwise. Many cafes offer kawa naturalna which is a strong brew made by sipmy dumping the coffee grounds in a cup or glass and pouring water over them. Other types, for example espresso or cappuccino are commonly available in cafes and bars. Tea (Polish: herbata) which is cheaper and more popular is drunk is glass often with lemon and without milk. Poland has a long history of vodka production. It’s no wonder this Northeastern European country is for a strict definition of vodka – the clear national beverage has roots in the Middle Ages, and the distillation of vodka has been a point of Polish pride for centuries. Although Poland is known as the birthplace of vodka (Polish: wódka) local beer seems to have much more appeal to many Poles. Vodka is drunk chilled and in one gulp. Another traditional alcoholic beverage is mead. Brewing has a beautiful and long tradition in Toruń although nowadays no brewery exists in Toruń, while in the 19th century there existed three. It should be noted that in the past brewers belonged to the wealthiest citizens of our city. There were many of them in the Middle Ages, and at the turn of the 15th century there worked 55 brewers organized in a special guild. On the other hand, there was a group of brewers working outside the guild and trading in beer illegally. Their beer was quite tasty and additionally considerably cheaper. For this reason frequent scandals and quarrels between the groups were breaking out. Finally, the strength of organized brewers was best proved by the fact that in elections to the city council in 1732, they achieved a total triumph. They took official seat from the President to an ordinary member of the board. Toruń's beer, especially "Przysieckie" (city council built in 1608 a brewery in Przysiek - Toruń's village property) was famous for an exceptionally good taste. It was exported to the cities of Gdańsk and Elbląg and was a recognized brand. Like at the present time, different tricks were undertaken for promotional purposes of our golden drink. You can find a record, that "in order to make Toruń's beer more famous throughout the Republic, a certain brewer Grzegorz choose to sail the Vistula". There would be nothing surprising in this story if it wasn't for the fact that he sailed in copper vats to brew beer from Toruń to Gdańsk, where he was apparently very solemnly welcomed among the sound of trumpets. In the St. Mary's church you can find a great Renaissance epitaph of one of the famous Toruń's brewer - Matthew Neisser. While in St. James's church there is painting of brewers guild dating back to 1677. The 13th century saw the development of viticulture in Toruń, encouraged by optimal weather conditions and rich soil. Sunny slopes of the Vistula Valley were particularly favourable to vine growing and soon the city actively engaged in viticulture, producing white sweet wines. Vine production centered around Winnica (Vineyard), a densely populated Toruń district, the name of which reminds of the vine growing industry till today. 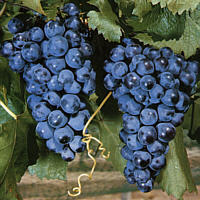 Apart from Winnica, vines were also grown in St. Catherine District and in the area to the south of today's Rapackiego Square. Vine cultivation in Toruń reached its peak in 1340-1380, which marked the period of a temporary global warming in the Middle Ages, and was brought to an end by the onset of Toruń fortress construction in the 19th century. In the 17th century Toruń could boast its own distillery. Alcohol was produced in Przysiek, one of numerous Toruń land properties, and, since the early 18th century, also in Rubinkowo grange, which was then the property of famous Toruń patrician Jakub Rubinkowski. 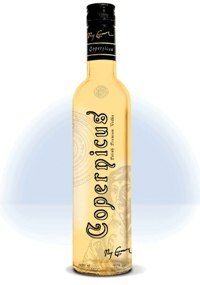 The history and tradition of producing vodka in Toruń dates back to 1884. At the end of the 19th century Toruń produced little amounts of rectified potato spirit and its production capacity did not change until the beginning of the 20th century. The main alcohol producer was H.A. Winkelhausen Incorporated Company established in 1923, which on 19th August 1925 was compulsorily taken over by the Polish State Treasury and, what follows, placed under the control of the state monopoly. The production of potato spirit and grain alcohol continued and the quality of the products improved considerably. Inns and pubs started appearing together with the town. We don't know how many places of that kind there were in 13th and 14th centuries, but for sure there were plenty of them due to mercantile character of Toruń. They also served as hotels. Census of merchants made at the turn of the 15th century mentions 55 brewers which can mean that there was simmilar number of inns. The first written information concerning the number of inns dates back to 1576. There were 102 inns altogether including 36 Polish ones (also those in the suburbs). One hundred years later there were 160 inns and in 1912 – 169 places of that kind. Inns had a significant meaning in old Toruń. They offered hospitality, entertainment, company, help with business matters; they were meeting places for numerous visitors and the best places for closing a deal as they served one of the most deserved product – beer, which was basic consumer article. First known regulations concerning beer in Toruń date back to 1300. According to the rules, it was not allowed to sell beer in basements, stalls, parcels with no houses. It was served only till 10pm (so called evening bell) and afterwards it was sold as a takeaway. An innkeeper who broke that rule could be sentenced to prison. There were also regulations concerning price and quality of beer. Inns were mainly located on the streets approaching city gates. Beer and wine was stored in the cellar of Old City Town Hall. It was also a place of trading in imported beer and wine which was a task of the City Council. The highest number of wine inns working in the cellar of Town Hall was 11; there were also 3 beer cellars where foreign beer was sold (from the towns of Gdańsk, Świdnica, Elbląg). Wine produced in Toruń was even more recognized product of this town; it was also exported to other countries. Apart from inns and private pubs, there were also for example guild inns or apprentice brotherhood inns. They were centres of social life of craftsman corporations. Guild inns were marked with signs showing guild's emblem or its characteristic product. They were places of meetings and ceremonies during visits of Polish kings or during feasts of patron saints, childbirth, baptism, weddings, funerals, etc. During these feasts huge goblets, mugs, cups, jugs and other vessels were used for drinking toasts. There were also other organizations that had their own inns. These were for example Trade Fraternity, Brotherhood of Saint George, etc. They were exclusive places and only corporation members could visit them. Later also monasteries had their own inns. The most well-known inn has been the one called 'Gospoda pod Modrym Fartuchem' ('Blue Apron Inn') which was founded in 1489. Tipping is generally very strange custom. Why should I tip? Do waiters deserve it? Why do they and not doctors, drivers, cashier in a bank or any other? W dziale "Polish cuisine" jest blad. Zupa pomidorowa to nie jest "patato soup" a "tomato soup". I'm an American living in Poland for 8 years and I always tip. I would be embarrassed not to. My boyfriend, on the other hand, who is Polish, never tips and he is always embarrassed when I do. Go fig!